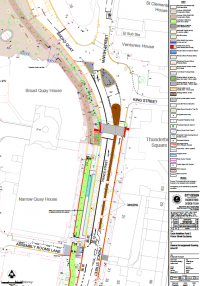 Travelwest have published their plans for a separated cycle lane along the length of Prince Street, from the Bridge (where work has already commenced) to Broad Quay. The plans show plenty of separation between bikes and cars, well above the recent standard of ‘shared space’ (that is, pavement cycling). Taking the cycle route inboard of the footway around Broad Quay could be questionable as design standards invariably say put pedestrians inboard of bikes, not next to motors. But it may be the bus stops or the many crossing movements here that have influenced this. Also the weak link in this design is the section north of Prince Street along Broad Quay. 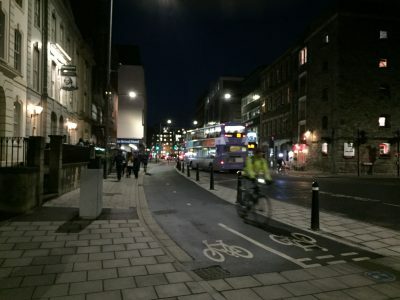 The cyclist either cuts across an extremely busy pedestrian ‘shared space’ area towards Park Street, or continues along Broad Quay to end up at Baldwin Street. 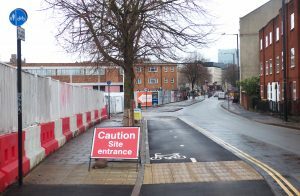 It doesn’t make sense why a segregated path could not be continued through this space to link Park Street with this route as well as the new route from Baldwin Street. For now we are assuming this will now go ahead, though do let us know what you think, as it’s not too late to influence some of the detail in the plans.. Please leave a comment, send an email or come along to one of our Space for Cycling forums. Last summer a major bridge in France was opened up solely for walking, cycling and public transport when Bristol’s twin city of Bordeaux bravely experimented with keeping private motor vehicles off the historic Pont Pierre. A report by our sister organisation in Bordeaux, Vélo-cité (Bike-City) tells a story with parallels to our own Prince Street Bridge, which has just reopened this summer after a two year restoration. During this time access was limited to walking and cycling (albeit walking with bikes). Is there anything we can take from their experience? 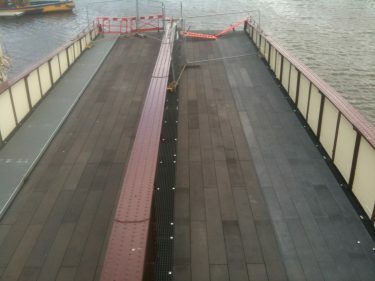 Update: The covers are off and we can now see what the renovated bridge will be like when it opens in the next few weeks. Note that the southbound lane has the same narrow pavement as before. Northbound now has a cycleway and a footway, with a very slight height difference. It’s not clear if there will be further visual cues to separate the two. Judging by the following response to our Prince Street Bridge petition from the Mayor’s office, it seems our concerns have been listened to and a compromise has been reached for now. Read on and let us know what you think by logging in here or commenting on Facebook. Prince Street Bridge is one of the few direct and flat routes across the floating harbour so it is important to use this route in the best possible way. The bridge has two carriageways, which do not give enough room for three transport modes: people in cars; pedestrians, including people on foot or using wheelchairs or mobility scooters, and; people on bicycles. 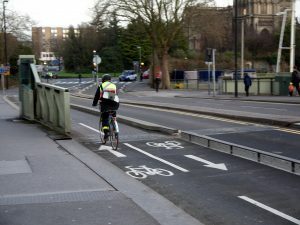 The bridge carries high volumes of people walking and cycling, and making them share one carriageway does not work well – both modes need their own segregated route with adequate width. Thank you for your petition regarding Prince St Bridge. I have previously committed to reopening Prince St Bridge to traffic to ease the pressure on the traffic network. This is important at the current time due to the number of major schemes taking place and about to take place across the central area. There are two key schemes due to start shortly in the area that we expect to have further impacts on traffic flows in the area – Temple Circus redesign and Prince St cycle route. Both of these schemes will deliver improved pedestrian and cycling routes in the area but both schemes are also likely to have some degree of impact on existing uses, particularly Temple Circus. Congestion in the central area has knock on effects across the city, generating high levels of air pollution, blocking other routes and causing long delays to bus routes. We are also conscious of the need to provide good facilities for pedestrians and cyclists, particularly while these works are ongoing. We are therefore proposing to reopen the bridge to southbound traffic only, maintaining the northbound closure, while these works are ongoing. This will enable additional capacity for traffic to exit the central area while Temple Circus works are taking place and impacting the network and also facilitate the construction of the Prince St cycle route scheme. Making the bridge southbound only will also provide benefits to southbound cyclists who will be able to use the southbound side of the bridge with no delays (as was previously the case when traffic signals were in place) and without the fear of having to contend with traffic coming the other way. This in turn will reduce the pressure on the mixed pedestrian/cycle side of the bridge. We will monitor traffic, pedestrian and cycle flows during this period. The long term use of the bridge will be reviewed following completion of these works. 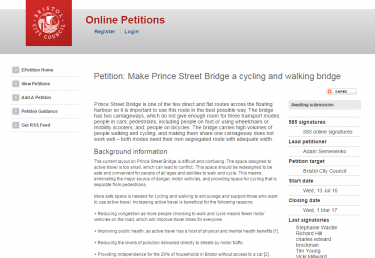 Today Bristol Cycling presented the petition, signed by 585 individuals, calling on Bristol Council to make Prince St. Bridge a walking and cycling bridge. Given just a minute to speak, we highlighted the benefits of cycling and walking in the city and the need to escape the congestion and air pollution caused by motor traffic. We look forward to the Council’s formal written reply. During the same meeting several other members of the public also spoke and presented petitions on other issues from around the city. Interestingly a common theme connected them all. Every single one mentioned the need to improve the city environment for the benefit of people: to help people get around, to exercise, and to escape congestion & air pollution. 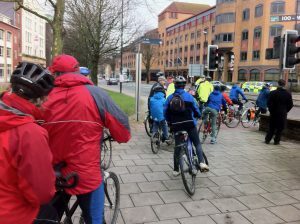 It should be clear to the Council the importance of taking urgent action and how much of a difference supporting walking and cycling can make to the people of Bristol – right now. Cycling is great for Bristol. Let’s make Bristol great for cycling. If you’d like to support Bristol Cycling you can join us here.